We couldn’t find a reasonable place to stay in the city, and even hostels were out of the question. Some were charging 80 Euro per person for a bunk bed. Um, no thanks. We’re in our thirties, and also… screw that. So we found ourselves in Lelystad, about an hour outside of Amsterdam. Staying outside main tourist or attraction areas has its advantages. Of course, it has its disadvantages too. It took us an hour to get to Amsterdam from Lelystad and it cost $10 per person each way. That’s another $40 for each day we wanted to go into town. Those little things do add up fast! 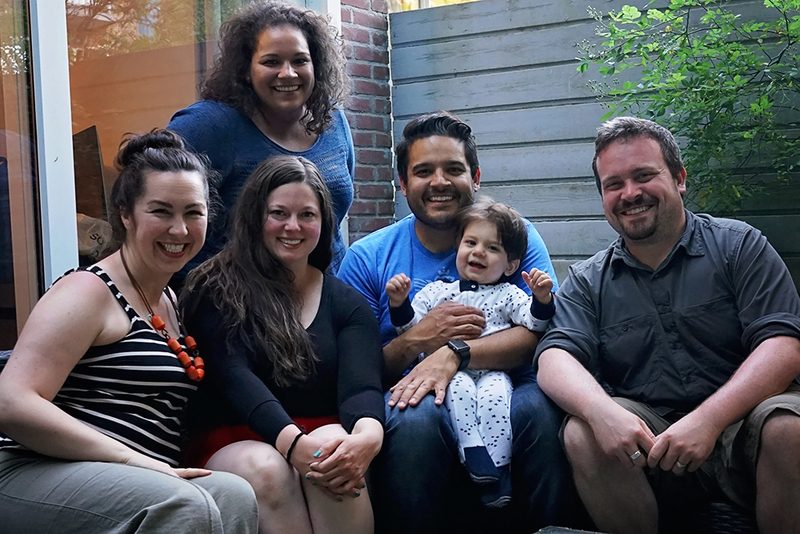 We timed our visit with some dear friends who were already planning to be in Amsterdam during that time. Having the luxury to meet some friends on the other side of the world was a pretty special thing! There is SO much to do in Amsterdam. From the museums to all of the amazing food, to just wandering along the canals. However, our only goal was to spend some quality time with our friends. We didn’t really care if we didn’t set foot in a museum on this trip. We knew our time was short, and there was no way we could really take it all in. So, we’ll save the attractions for the next time. What we did do: Ate some amazing food. Took in the sights along the canals. Enjoyed people watching (of which Amsterdam has to be one of the best places for), walked through the Red Light Distrect with a stroller, and just enjoyed being with friends. It was perfect! Walks in Lelystad- They have beautiful canals too! We spent the rest of our days near our Airbnb in Lelystad, which was a detached mother-in-law type unit in our host’s backyard. It was a great little cottage for us. Lelystad is a quiet town just north east of Amsterdam, right on the water. We did a bunch of walking and exploring. I can see why bikes are such a necessity in the Netherlands. The landscape is so flat, and the country has so many easy-to-access bike paths. We didn’t have the opportunity to rent bikes where we were, which was a bit of a bummer, but we thoroughly enjoyed our walks. We only wish the grocery store had been closer to where we were staying. (lesson learned to check the map for stores before you book!) It was about a 30-minute walk each way to get to the nearest store where we could buy food. Where we were staying it was very close to public transportation to get us to the train station, but not much else. It was a quiet rest of the week in our little Dutch bungalow. We got some work done and had some much-needed decompression time after the UK. I had visited Amsterdam before, and I really do look forward to going back and seeing some of the sights we missed on this round. It really is a wonderful city.